I sauntered into Price Commons Tuesday night and heard an uncharacteristically loud rhythm. It’s a low, rhythmic thumping as if a pack of wild animals were running about. As I neared the Glass Lounge, I saw not a stampede of animals but a synchronized motion of arms, slapping against finely-crafted African drums. 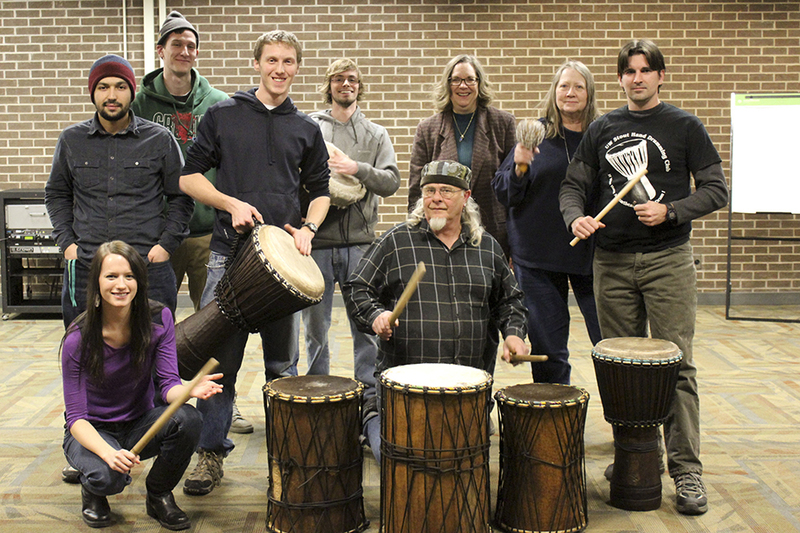 What was an intense encounter for me is just another day in the life of the University of Wisconsin–Stout’s Hand Drumming Club. The club was founded in 2000 by Nels Linde, a ceramic artist and drum builder of 25 years, with the help of his friend and seasoned hand drummer Kathy Colvin. The club soon became an official student organization under the advisement of Professor Margaret Nelson, and has been growing ever since. According to President Charles Billman, the club’s e-mail list consists of more than 150 members. Billman manages the club by organizing events and teaching members how to play the intriguing instrument. I was able to witness this incredible coordination during Tuesday night’s meeting as Billman and Colvin began playing basic polyrhythmic patterns. The other members, seated in a circle with their rope-tuned West African hand drums called djembes quickly followed suit, producing a perfectly synchronized sound. So welcome, in fact, that they invited me to join their practice session. Billman gave me a djembe and seated me next to Vice President Cecil Dehart, who taught me how to produce slap and bass tones. “Strike the center of the drum with your whole hand, then let it rebound,” Dehart said as he played along with the music. Despite my lack of percussion experience, I was able to pick up the techniques rather quickly. As the tempo sped up and more performers joined in, everything clicked, and my muscle memory took over. While the performance became more intuitive, the music still felt very foreign. “The most enjoyable part of playing hand drums, as a musician, is that it makes you think outside the box,” Dehart said. Many other club members echoed this sentiment. A hip-hop artist in his spare time, Andrew Heldstab joined the club in search of new musical influences. “I’ve been able to carry the rhythm of hip-hop into my hand drum playing, and vice versa,” Heldstab said.